Dermarollers have been around for some time now, but have been mainly used to rejuvenate the skin. It has been discovered that dermarollers can actually help with hair growth, and are quite effective at doing so if you find the right dermaroller and use the correct technique. A dermaroller is a basic device that creates tiny pinpricks on the skin. The pins are set on a wheel that is rolled over the skin. The pinpricks penetrate into the dermal layer, only going far enough to stimulate the production of new cells and to boost blood circulation, without being painful or damaging to the skin. It is also known as ‘micro needling’. Dermarollers have always been used to renew the youthful look of skin by successfully promoting collagen, which reduces the appearance of lines and wrinkles. How does a dermaroller help with hair growth? In the same way a dermoraller is used to promote collagen production, it can also be helpful in increasing cell production and improve circulation in the scalp. This will, therefore, lead to an increase in hair growth. Remember to only use the dermaroller on dry hair, as wet hair might tangle up in the dermaroller and cause unnecessary pain. Place the dermaroller on the end of the designated target area (for example on the hairline). Slowly roll the dermaroller over the targeted area horizontally and then vertically. Apply enough pressure to feel the pins penetrate the scalp, causing a tingling or prickling feeling, but not enough to cause pain. If there happens to be hair in the area where you are rolling, move in the direction of the hair to avoid it tangling in the dermaroller or the hair being pulled at the follicles. You can do this technique in certain areas or perform it over your whole head. Once finished, wash the dermaroller using an antibacterial soap or rubbing alcohol. Let it dry and place it back in its protective case. You can do this routine at least once a week, but anything more than twice a week might be harmful to the regrowth of hair. To start off your search for the best dermaroller to encourage hair growth, here are some of the best on the market for you to try. This dermaroller kit is a great kit to use at home. It promotes healthy glowing skin and increases hair growth. It comes included with one micro-needle roller and one plastic storage case. The roller removes dirt and toxins from deep inside your skin and gives the cells a rejuvenation. 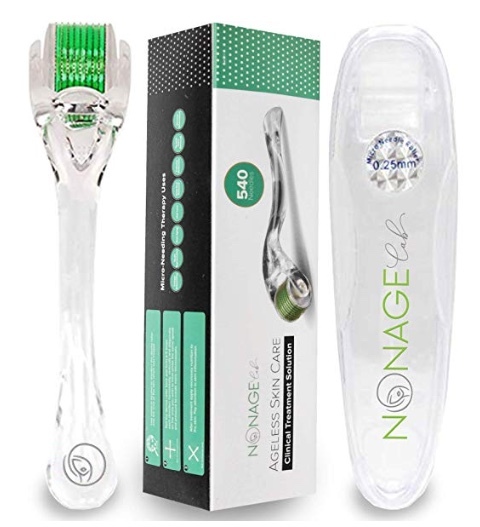 It is a multi-purpose dermaroller, it can be used to promote healthy looking skin, prevent wrinkles, stretch marks, acne scars and help with promoting hair growth. The high-quality titanium needles massage smoothly into the skin and will not break or bend, as well as being hygienic and easy to clean. The 0.25mm microneedles can be used on the face, body, and scalp with no pain or bleeding. For a chance at hair growth, this is a great dermaroller to look to. Not only does it promote regrowth of hair but it assists in giving a glow to the skin, and encourages production of collagen to lessen the appearance of wrinkles. The high-quality titanium pins stimulate and help to accelerate the regrowth of hair. The ergonomic design and quality materials come together with intuitive handling. This particular dermaroller is perfectly safe for home use. It is made of 540 premium-grade and titanium micro-needles that are 0.25mm in length. The dermaroller comes included with a silicon makeup blender, just as an extra treat. This home therapy kit is exactly what you need to help with hair growth. The silver cosmetic needling instrument and free cleaning cup come in a convenient and handy bag that just helps make things a little easier. The dermaroller is UV/Gamma sterilized for added protection, and the pins are made from titanium and stainless steel, measuring the tips at 0.3mm. A kit to use at home, it comes with a ZustBeauty skin care case and a sterilizing cup that helps keep your dermaroller free from germs, and therefore your skin safe as well. There is also a manual included so you can make the most of your new dermaroller. This SanDine microneedle kit is designed specifically to be used at home, saving you the cost of visiting a salon. The kit is made from titanium and comes with a full 100% guarantee. It is safe and painless to use, with the needles measuring 0.25mm. The application is painless, but it still yields a successful result. Made from high-grade titanium, the dermaroller will stay durable and strong for a long period of time. 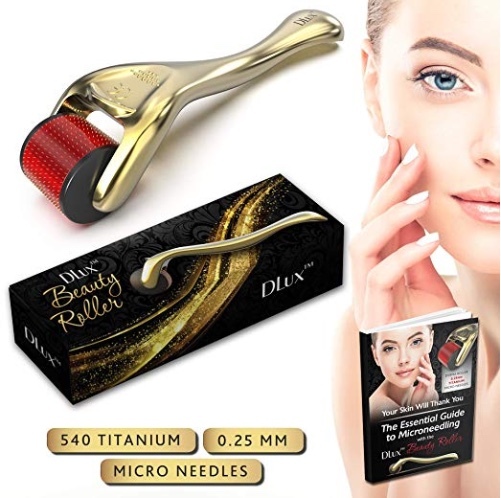 Use this microneedle dermaroller to achieve the hair growth you have been longing for, all from the comfort of your home and pain-free! This cosmetic needling instrument has a needle length of 0.25mm, which is the perfect length for home use of a dermaroller. The dermaroller can be used along the face, forehead, nose, scalp, neck, and chin. It is multi-purpose, allowing for the rejuvenation of the skin and for promoting hair growth in targeted areas. A unique design dermaroller, it also comes with a storage tube and a user manual to guide you through using and sterilizing your new microneedler. The sleek black design makes it easy to use, and looks really professional as well! 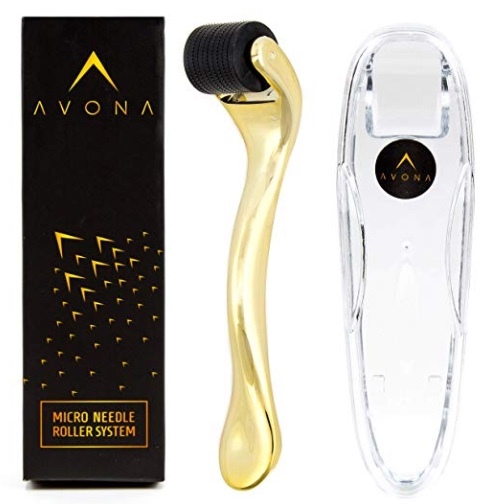 The Avona Derma Roller has been designed to suit both men and women, which is a great help for men who are looking for a device to help them promote regrowth of hair. It can even be used to stimulate facial hair growth as well. It will help promote hair growth, but will also leave your skin looking young and radiant. The microneedles are perfect for home use, and with Vitamin C Hyaluronic Acid Serum, the needles penetrate far enough to create the desired effect, without being painful. With an included carry case, your dermaroller will be kept away from harm and kept clean, exactly what you need it to be when you use it. The only thing better than one dermaroller, is two dermarollers! The NoveLife premium dermaroller kit is a two-for-one, so you will always have a dermaroller on hand. The 540 microneedle rollers have a length of 0.25mm, making them perfectly safe for home use. They give the skin enhanced absorption of moisturizing nutrients and stimulate the production of hair. These dermarollers are great for use by a novice and remain a powerful and safe tool to encourage hair growth. The needles are short enough to be non-invasive but still give great results. Made from titanium, the needles will not break or wear. An innovative design of the dermaroller gives this an edge above the rest. Hundreds of contact points stimulate hair growth and leave skin looking healthy and glowing. It is safe and painless to use, with the dermaroller being made from 540 premium-grade titanium microneedles, which are 0.25mm in length. This length has been approved by the FDA to be safe for home use. The dermaroller comes with a carry case to keep it safe, and an eBook explaining all the ins and outs of micro needling, and how to use it for yourself. The carry case also helps reduce the chance of infection, by keeping germs off of a recently sterilized dermaroller. Yoove Microneedling Rollers have been carefully constructed with only the finest 18/8 grade stainless steel. They use stainless steel over titanium as it is more hygienic and safe. The stainless steel pins are safe and non-toxic to use, perfect to be used at home. The size of the needles is 0.25mm, which make them a great option to use yourself at home as they are not long enough to cause any damage to the skin or cause pain. However, if you are treating deeper problems and want to encourage hair growth in tough areas, their 0.5mm roller might be a better option. 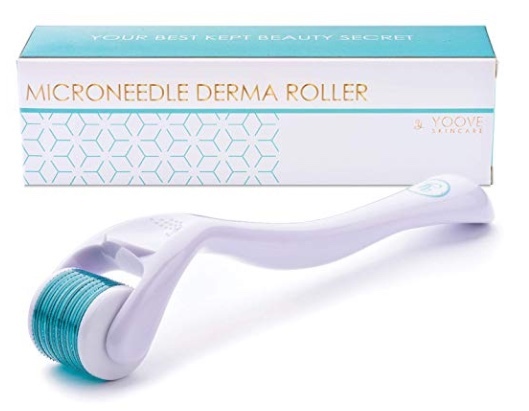 The Yoove dermaroller comes with a comprehensive guide that allows you to learn how to properly use and care for your dermaroller, making it do more good and no harm. This cosmetic needling instrument offers a healthy glow and promotes healthy hair growth in targeted areas. The microneedle length is 0.25mm, which is a great exfoliating and penetrating length, without causing pain or irritation. The set comes with a comfort grip handle, a microneedle roller and a plastic storage case. Sdara Skincare also have a Vitamin C serum which can be applied to the skin after using the dermaroller, for extra nourishment. A new 2019 model, this is one of the newest options on the market. The dermaroller is made with premium titanium and is non-invasive and completely safe to use. The 0.25mm needles are sharp and safe but do not penetrate to the living layers of the skin. The silver handle sits in beautiful contrast to the deep purple roller, and the metal pins add to the sophisticated look, but it is all perfectly safe to be used by newbies. With the dermaroller and protective kit, you will receive an Ebook that details all the micro needling information you need to get started, and how to properly care for your microneedler and how to stay while using it. Many people aren’t completely comfortable when using a dermaroller for the first time, so there are some common questions that may pop up. Which size dermaroller is best? Try and stick to a dermaroller that is around 0.5mm. Anything smaller than 0.25mm won’t have too much of an effect on the skin. Anything larger than 1mm might cause damage. Can a dermaroller cause a skin infection? The simple answer is yes. But that is only if you do not properly clean and care for your dermaroller. After use, clean it properly with boiling water, antibacterial soap or rubbing alcohol. This prevents any bacteria or germs being pricked into the skin with the next use, which could cause infection. 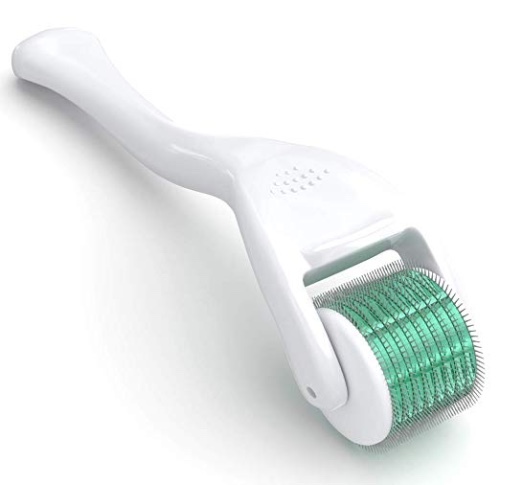 If irritation does occur, or if your skin is irritated before using the dermaroller, hold off until it has healed. Can a dermaroller pull hairs out? As the pins are small, they should not be able to pull any existing hair out. Be sure to move with the flow of the hair and only use the dermaroller on dry, clean hair. Just keep checking that it isn’t doing any damage. Shorter strokes might also help keep any hair from becoming tangled in the roller. How much pressure should I apply when using a dermaroller? You need to push the dermaroller firmly enough so that it penetrates the skin, but not too much that it causes pain or discomfort. The pins should be pushed down to their length. There should be no blood drawn, and no visible redness from around 30cm away. Start off lightly and then increase pressure until you are comfortable. Which direction should I move the dermaroller? In order to get an even and good coverage, you should roll the dermaroller in different directions across the scalp or targeted areas. This way, no spots are missed. 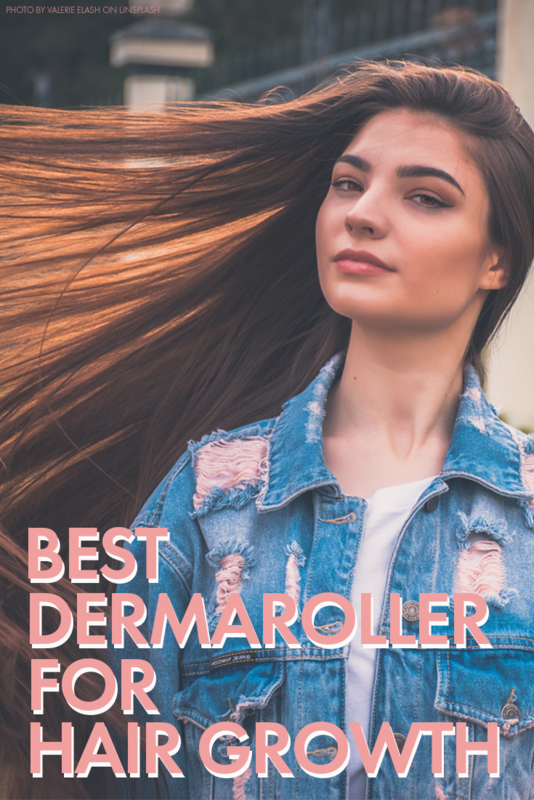 With so many on the market, it can be difficult to know which dermaroller would be best for you. Make sure to check that the needles are made with a quality metal that will not break or fade. Keep your dermaroller clean and sterilized, and you should have no problems at all. Use it once or twice a week and soon you will see the amazing effects it will have with promoting hair growth.